You can check what I've done to that picture image. I'm doing all manually. Are you interested to have one? It's depending on the complexity of your image. The price is depending on how long it takes time to make it. You can see the smooth skin. Detail lighting. 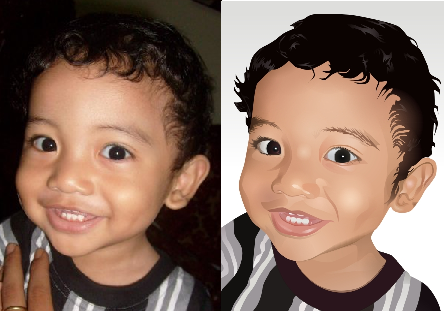 Nice vector right? Wait for at least one day to finish my vectorize work. And then I will email you the vector file and PNG/JPG file for preview. Order now! before the price rise! Buat di manual make Coreldraw atau lgsung ada software pengolah otomatis ni mas??? Mantab!!! Gan untuk harga /vektornya $70? ato bisa harga kawan? hahaha..
-Bonus deposit 10rb untuk yang deposit pertama kali 50rb. your guests? Is gonna be again continuously to inspect new posts.